if you have any questions , Please contact email mancy@kuwfi.com when you meet any technical issue. CPE-80R is an 11ac 5G outdoor CPE with LED display. show operation mode, channel, signal strength and CPE name(H or C) no need to access into GUI, avoid the complex setup program, save much human work and cost, make the long range wireless coverage, data transmit and wireless monitoring simple and professional. 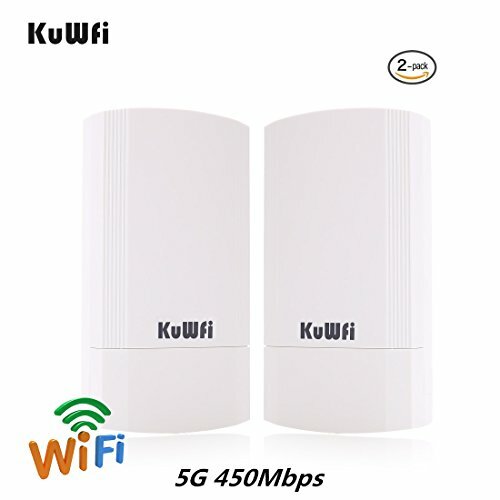 Compatible with 802.11ac,5GHz 450Mbps wireless speed ensures high speed internet access and more end users access. Very simple installation, wireless outdoor cpe kit CPE80SR with Pre-configured, ready to install. with smart web management, it can be pairing automatically. effective solution for PTP, PTMP application and outdoor long range wifi coverage and Easy to set CPE with IP camera(cameras) and networks DVRalso support long range wifi cover .